Can you imagine a bank whose customer service agents create rapport with customers, so much so that they will learn intimate information about the customer and act on it? For example, a customer service agent might talk with the customer about literature and then send them an actual book in the mail. This is not strange for ATB Financial, formerly known as Alberta Treasury Brand Financial—this bank is not your average contact center. Benchmarking itself with companies like Starbucks and Apple, ATB Financial decided to do something different when it comes to the freedom they give their contact center agents. 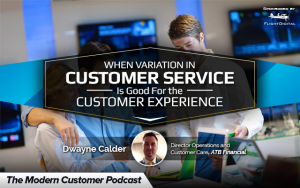 This week’s Modern Customer Podcast guest is ATB Financial’s Dwayne Calder, director, customer care and operations. Leveraging call recording to replace “handwritten customer signatures” with verbal consent, the company reduced customer effort and elevated the customer experience. With a focus on supporting its customer experience process design, ATB Financial employs speech analytics to translate voice of the customer data into actionable improvements by using customer conversations and frontline team members to identify the root cause of customer challenges. ATB Financial is a unique bank with a compelling customer engagement story. Tune into this week’s Modern Customer Podcast to hear more.